Learn how the TRX Trainer can be your ultimate yoga prop! TRX Yoga Fusion is a format create by OMY Owner Lindsay Lambert for all levels & every body! Lindsay started her TRX education journey 8 years ago. She has now completed her Suspension Training Course (STC), Group Training Course (GTC) & Advance Group Training Course (AGTC) certifications with TRX. Join Lindsay in TRX Yoga Fusion to improve your mobility and stability, while refining your yoga postures. Together, TRX and yoga safely deepen stretches and increases core strength. 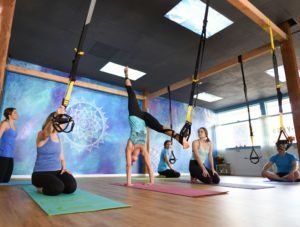 The TRX suspension trainer both supports and challenges many yoga poses, making advanced poses more accessible by eliminating any fear of falling, boosting essential core strength and guiding you toward optimal alignment. All levels welcome! Beginner friendly class! The TRX trainer was invented by a Navy SEAL to hone balance, flexibility, strength and core stability simultaneously. It consists of a hanging strap that gives you leverage against gravity to assist you in difficult yoga poses, while also working the strength and flexibility you need to achieve the pose in your regular yoga flows. Just like traditional yoga props such as blocks or bolsters, the TRX trainer can be used to support and enhance many poses. Because you are partially suspended, TRX develops muscle strength and helps build confidence for poses that be difficult or scary. Can’t balance on one leg for tree pose? TRX can help! Headstands sound terrifying? Not a problem! TRX Yoga Fusion is for EVERY Level! Beginners. TRX is a great tool to assist the to get more closely in tune with their bodies and explore different types of yoga poses. There are a numerous ways to use the strap to learn how to better engage. Experienced Yogis. 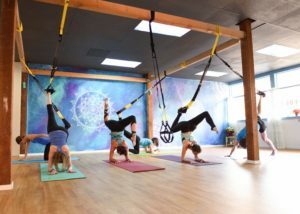 TRX assists in safely working on challenging poses like inversions, arm balances, which can be scary or complex in a normal yoga studio. Using the straps, you will learn which muscles to engage in a pose without supporting all of your body weight or worrying about falling. This kind of support teaches your body how a pose should feel and tone muscles in an unexpected way. An added bonus of TRX Yoga Fusion is a big boost in confidence. Intermediate and advanced yoga poses like Crow, Handstand and backbends can be scary at first. The security of the anchored strap makes it easier to face those fears and feel the possibility. Click HERE to try your 1st class FREE!